Ms. Leiden, RB Voss. Lat. F 113 is one of the more precious pieces of the Special Collection at Leiden, containing two rare geographical texts, the Cosmographia of Aethicus Ister and the anonymous De situ orbis terrae. It is a composite bound together from four original units, which, according to the Katalog of Bernhard Bischoff, all originated in the third quarter of the ninth century at Tours. The first unit of four octava and a sexto marked with quire marks I to V contains the Cosmographia (1r-30r) and the beginning of the Historia Apollonii regis Tyri (30r-38v) that is cut off in chapter 36. The second unit of one octavo marked as XI contains the end of the Historia de excidio Troiae of Dares Phrygus (39r-46v). The third unit marked as quires VIIII to XI contains two hagiographic texts about the apostles and hymns to the respective saints cropped at the beginning (47r-50r) and a dossier of Augustinian material extant in full (50r-70v). The last unit consisting of two octava and a quarto does not bear quire marks and contains the complete De situ orbis terrae (71r-90v). All units were copied by experienced hands of Tours scribes. In the company of such illustrious texts, it is understandable that the cluster of the hagiographic material present in folia 47r-50r did not attract much attention. This fate, however, will be reversed in this blog post. How do these hagiographies fit into the collection of otherwise unrelated texts? Or is their appearance in Voss. Lat. F 113 a mere coincidence that should not arouse our attention? I don’t think so. De Meyier’s Catalogue from 1973 identifies the content of 47r-50r as the Translatio Simonis Chanei et Judae Zelotis (BHL 7749), a hymn on Simon and Jude (Chevalier 20431), the Legenda Matthiae apostoli (BHL 5718) and a hymn on Matthias (Chevalier 23066). The first of the texts is, in fact, a section of longer hagiographic (or else apocryphal) narrative about Simon and Jude (BHL 7749-7751) that was cropped after the quire containing it was dismembered from its original. The cropping indicate that a quire must have existed once that contained the remaining of the text. The quire mark VIII in turn suggests that the two hagiographic texts might not be alone in the original codex from which they were removed, but, together with the Augustine that follows them in much the same format, were a part of a larger collection, potentially of other hagiographies. Voss. Lat. F 113 contains a unit with lower quire numbers that could have been originally part of the same codex as the quires VIIII to XI, yet the distinct content might speak rather for unrelated origin. Even if so, three quires preceding the acts of Simon and Jude remain unaccounted for. Hagiographical texts about the apostles have a history that goes back into the early centuries of Christianity and are therefore often categorized as early Christian apocrypha. The oldest texts about the fate of the apostles after the Ascension, the apocryphal acts of some of the apostles, may be dated perhaps already into the second century. Many more came into being in the later periods, particularly from the fourth century within the context of growing cult of the apostles. A number of them would, as a result, but not exclusively, feature in liturgies for particular feast days of the apostles. From the late eight century one encounters in the Latin West fully formed collections of apocryphal/hagiographic material that focus solely on the apostles. Els Rose, who is studying these collections, termed them the Virtutes Apostolorum (replacing the older name Collection of pseudo-Abdias). The origin, authorship, sources of the Virtutes and their relationship to texts about the apostles in other languages are so far elusive although recent research brought some promising insight into the emergence and development of the Virtutes. This collection should be seriously considered here, since BHL 7749, and its variant BHL 7750, were one of its central components, never missing from its contents. The Virtutes Apostolorum were not the only format in which the hagiographies about the apostles could be transmitted in the early Middle Ages, naturally. Yet the evidence seems to indicate, that the collection and incomplete sets of narratives that resemble the Virtutes Apostolorum in terms of organization of the material were the most common. Solitaires and small clusters of texts were rare, on the contrary. The Biblioteca Hagiographica Latina Manuscripta (BHLms) database lists, for example, no manuscripts containing Simon and Jude, but no other apocryphal text about the apostles, prior to the eleventh century. Other formats included hagiographic collections that followed the order of the saints in the liturgical year, and those that were more miscellaneous, displaying combination of these and other patterns. In majority cases, however, these contained only or primarily hagiographic material. This short excursus on the textual history of the apocryphal acts of the apostles is necessary, since it may have some implications for understanding the cropped text in the ninth-century Voss. Lat. F 113. I want to stress that my following conjectures must be considered only speculative, unless the missing part of the original whole is found, or the early hagiographies of the apostles are better understood and the manuscript evidence sifted through. One of Rose’s observations about the Virtutes Apostolorum was that even though the collection is often accompanied by other texts, including hagiographic narratives concerning saints other than the apostles, the apocrypha tend to retain their integrity, being clustered together as a separate group even if they disrespect the order of the saints’ feasts in the calendar. Also, while the order of the protagonists and narratives about them is not completely fixed within the Virtutes Apostolorum, there are certain tendencies in ordering such as the sequence of the apostles in the liturgical year and perceived hierarchy of the apostles. The acts of Simon and Jude (BHL 7749-7751) appear usually towards the end of the collection, being more obscure saints with less prominent cult, and at the end of the round of the apostles in the liturgical year. The acts of Matthias (BHL 5695-5719) were classified by Rose as not belonging to the Virtutes Apostolorum proper. Matthias, however is one of the saints who tended to be attached to the Virtutes Apostolorum, together with Marc the Evangelist, Luke the Evangelist, and Barnabas, the companion of Paul, other major figures related to the apostles and mentioned in the canonical Scripture. A narrative about Matthias follows the Virtutes Apostolorum, in seven manuscripts listed by Rose in her overview of twenty-five of the early Virtutes Apostolorum manuscripts. In two of these, ms. Munich, BSB Clm 12641 (12th century; Ranshofen, Bavaria), and ms. Vienna, ÖNB 560 (12th century, second half; Abbey of Rein, Carinthia), Matthias is the only other text in the manuscript; and in case of two more, ms. Vienna, ÖNB 497 (13th century), and ms. Paris, BN lat. 12604 (12th c.), there is a break between the Virtutes followed by Matthias and the rest of the manuscript content. Moreover, in at least five cases, Matthias follows one of the versions of narratives about Simon and Jude. However, it must be also noted, that all these manuscripts are significantly younger than the one from Tours, and the Matthias narrative that can be found in these manuscripts is BHL 5695, BHL 5700, BHL 5701 and BHL 5705, not BHL 5718 as in the Tours manuscript. For a comparison, when ordered according to the calendar, Simon and Jude (October 28) follow after Matthias (February 24), not precede him. Moreover, the two are separated by texts for the feast days lying between the feasts of the apostles in the calendar. In miscellaneously ordered collections, the combination Simon and Jude with Matthias may occur, but should by no means be considered as likely as in the case of the Virtutes Apostolorum. There is yet another interesting aspect of the hagiographies in Voss. Lat. F 113. BHL 5718, the legenda of the apostle Matthias, is attested according to the BHLms only from the twelfth century, and recorded only in two manuscripts: Angers, BM 807 (12th century), and Milan, Bib. Amb. C 125 inf. (13th century). This might have suggested that it is relatively late in terms of origin and distinct from the apocrypha preserved in the Carolingian manuscripts. Neither of the two manuscripts, moreover, contains the Virtutes Apostolorum, although both are collections of hagiographies that include some apocrypha about the apostles. I was not able to find any other manuscript that would contain this very text. Voss. Lat. F 113 is, then, a unique witness of the narrative, which comes much closer to the apocrypha in the Virtutes Apostolorum in terms of transmission than might have been expected. For contrast, the Tours manuscript is roughly contemporary with the two sermons on Matthias ascribed to Bertharius of Monte Cassino (d. 883) listed as BHL 5695-5696, the earliest hagiographies of Matthias given by BHL. It is thus possible that BHL 5718, on account of Voss. Lat. F 113, is one of the oldest, if not the oldest, preserved hagiographic material about Matthias, and I must stress that in a number of cases the narratives preserved in the Carolingian manuscripts are clearly of older origin than the manuscripts. The only safe terminus post quem that can be established for BHL 5718 has to do with the presence of the excerpt from the pseudo-Clementine Recognitiones, a late antique Christian novel about the life of Clemens, successor of Peter, composed with all probability in Greek. The Recognitiones were translated into Latin in the 400s by Rufinus of Aquileia. Thus, BHL 5718 must be dated between the early fifth and late ninth century. In this respect, it has profile very similar to other apocryphal acts of the apostles preserved in the Virtutes Apostolorum, not only on account of the dating, but also because of its employment of the Recognitiones. The standard text for Peter (BHL 6663) contains as many as sixteen excerpts from the very same text. The text of James the Less (BHL 4089) contains another excerpt from the novel. Moreover, these narratives and some other, such as BHL 6575 on St. Paul and the short text De exitu Herodis (BHL 4318), are sewn together from multitude of excerpts, some scriptural, other from the Recognitiones and Historia Ecclesiastica, and other from older hagiographies. BHL 5718, which is in fact a blend of excerpts from Act 1, 15-26 and from the Recognitiones I 60, 5-7, fits well into this category of sewn-together hagiographic (or else apocryphal) texts. Yet, there is also one crucial difference between BHL 5718 and the narratives in the Virtutes Apostolorum and that is its explicit reference to the sources (Lucas evangelista in actibus apostholorum meminit his verbis dicens, sicut Clemens in primo narrat historiarum libro), such as are absent from the other apocrypha mentioned. Rémi Gounelle points out that the trend in the Christian apocrypha is that the more accurate the reference, the younger the text. Could it then be that in this case the acts of Matthias were constructed in a manner similar to the older apocryphal acts under their influence? Or perhaps independently on them, even if in the similar manner? Or could BHL 5718 be an exception to the trend observed by Gounelle? In the light of the evidence, what can be said about the two hagiographic texts about the apostles in Voss. Lat. F 113? It is not impossible that the Tours manuscript is a singular example from the ninth century of a transmission of the acts of Simon and Jude and a legend of Matthias as a separate cluster. The BHLms database mustn’t be considered complete and exhaustive and must be consulted cautiously and thus it is possible that more manuscripts that would attest to such fragmented transmission of the acts of Simon and Jude do exist. Yet, certain features of the hagiographies in Voss. Lat. F 113 may be taken as indicating something else. The acts of Simon and Jude are followed by the acts of Matthias as is the case in many manuscripts of the Virtutes Apostolorum. This order disrupts, on the contrary, the liturgical round of the saints, but would follow their relative hierarchy, particularly if the Virtutes Apostolorum or their section would be originally present in the Tours manuscript. Other texts, that could be expected to follow Matthias in a liturgically or otherwise arranged collection, are missing. Instead, it seems, Matthias was a last text in a possible collection, just as it is in some manuscripts of the Virtutes Apostolorum. BHL 7749 is, moreover, one of the usual narratives about Simon and Jude in the collection. BHL 5718 is not attested in other manuscripts of the Virtutes, but displays traits that are akin to some of the apocrypha in the Virtutes and a similar dating can be proposed for it. If the quire signatures may be trusted, there were seven more quires preceding the one with the end of the acts of Simon and Jude, presumably octava as is the case with quires eight to eleven. This makes an estimate of 56 folia which could accommodate the whole of the Virtutes Apostolorum or their substantial part. Even if it is presumed that the first section of the manuscripts encompassing the first five quires was adjoined originally to the latter part containing the cropped acts and the Augustinian material, but this seems unlikely to me, given that they contain as divergent text as the Cosmographia of Aethicus Ister, there are still three quires missing in between that could accommodate at least a portion of the apocryphal acts of the apostles, such as the acts of Bartholomew and Matthew, who are usually clustered together with Simon and Jude in the Virtutes Apostolorum. I imagine that the quires in which the rest of the acts of Simon and Jude and of Matthias may be found and which contain also Augustinian material, were dismembered from the original on account of Augustine. The works of the Church Father were originally a part of codex where the whole acts of Simon and Jude could be found, and possibly other hagiographic texts as well, and were preserved on the expanse of the rest of the codex. The end of the apocryphal acts, which extended into these quires, was preserved together with it by accident, providing a welcomed evidence that a collection such as the Virtutes Apostolorum might have been present at Tours in the third quarter of the ninth century. And even if such a conclusion may seem far-fetched and should not be accepted uncritically, Voss. Lat. F 113 still is a valuable early witness for BHL 5718, a legend of Matthias with traits akin to the narratives contained in the Virtutes Apostolorum, and thus closer to the pre-medieval Christian apocrypha than was expected. Authperti Abbatis Cassinensis sermo de sancto Matthia. PL 129, cc. 1024-34. 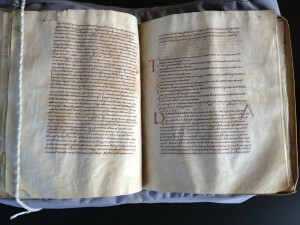 Biblioteca Hagiographica Latina Manuscripta. At: http://bhlms.fltr.ucl.ac.be/default.htm. B. Bischoff (1998, 2004), Katalog der festländischen Handschriften des neunten Jahrhunderts (mit Ausnahme der wisigotischen), Teil 1: Aachen-Lambach (Wiesbaden, 1998), Teil 2: Laon-Paderborn (Wiesbaden, 2004). B. Ebersperger, ed. ‘Catalogus codicum hagiographicum Latinorum Bibliothecae Ambrosianae Mediolanensis’, Analecta Bollandiana 11 (1892): 205-368. S. Gioanni and B. Grévin (2008), L’antiquité tardive dans les collections médiévales: textes et représentations, VIe-XIVe siècle. Rome. J. Irmscher and G. Strecker (2003), ‘The Pseudo-Clementines’, in New Testament Apocrypha: Writing Relating to the Apostles, Apocalypses and Related Subjects. ed. W. Schneemelcher. Westminster, pp. 483-540. K. A. De Meyier (1973), Codices Vossiani Latini: Codices in Folio. Leiden. B. Rehm, ed. (1965), Die Pseudoklementinen II. Rekognitionen in Rufins Übersetzung. Berlin. H.G. E. Rose (2009), Ritual memory: the apocryphal Acts and liturgical commemoration in the early medieval West (c. 500-1215). Leiden. H.G.E. Rose (2012), ‘Virtutes Apostolorum: Editorial Problems and Principles’, Apocrypha 23 (2012): 11-45. H.G.E. Rose (2013), ‘Abdias scriptor vitarum sanctorum apostolorum? The ‘Collection of Pseudo-Abdias’ reconsidered’, Revue d’histoire des textes 8: 227-68. W. Schneemelcher, ed. (2003), New Testament Apocrypha: Writing Relating to the Apostles, Apocalypses and Related Subjects. Westminster. E. Steinová (2011), Biblical Material in the Latin Apocryphal Acts of the Apostles. [Master Thesis]. Utrecht. At: http://igitur-archive.library.uu.nl/student-theses/2011-0721-203518/UUindex.html. This blog post is partially based on my work in the NWO VIDI project The Dynamics of Apocryphal Traditions supervised by Dr. Els Rose from Utrecht University. More information about this project can be found at: http://www.uu.nl/FACULTY/HUMANITIES/EN/PROJECT/APOCRYPHAL-TRADITIONS/Pages/default.aspx. I would also like to thank the Special Collections of the Leiden University for allowing me to use the photo of ms. Leiden, UB Voss. Lat. F 113. This description of the quires as well as content is taken from De Meyier (1973), pp. 242-45. Good overview of the apocryphal texts concerning the apostles may be found in Schneemelcher (2003). But even so in hagiographic collections. Thus in ms. Trier, SB 1379 (1413) from the first half of the eleventh century. At: http://bhlms.fltr.ucl.ac.be/Nquerysaintrubrique.cfm?code_dossier=Simon%2001&rubrique=Simon%20et%20Iudas%20%28Thaddaeus%29%20apostoli. Based on the project meetings of the Virtutes Apostolorum group. Fifteen out of twenty-five manuscripts listed by Rose have the acts of Simon and Jude as the last item of the Virtutes Apostolorum. See Rose (2013). Thus also in the Italian collection of the apocryphal acts of the apostles, ms. Vatican, BAV Vat. lat. 5771. See BHL manuscripta, at: http://bhlms.fltr.ucl.ac.be/Nqueryfolio.cfm?numsection=2377&code_bhl=7750&ville=Vaticano&fonds=Vat.%20lat.&cote=05771. See Rose (2013) for overview of the most important manuscripts containing the apocryphal acts of the apostles, and also Rose (2012). These are: Bamberg Misc. Hist. 139 (12th century, Regensburg); Munich, BSB Clm 12641 (12th century; Ranshofen, Bavaria); Paris, BN lat. 9737 (12th century); Paris, BN lat. 12602 (12th century); Paris, BN lat. 12604 (12th century); Vienna, ÖNB 497 (13th century); and Vienna, ÖNB 560 (12th century, second half; Abbey or Rein, Carinthia). In the other two cases, the acts preceding the text on Matthias are that of Thomas (BHL 8140) and of John (BHL 4320). But note the low degree of fixity in this respect. The components of the Virtutes Apostolorum have usually only one or two variants, while four are attested for Matthias, who is not part of the collection. See examples in BHL manuscripta, e.g. ms. Chartres, BM 144 (10th century), at: http://bhlms.fltr.ucl.ac.be/Nqueryfolio.cfm?numsection=234&code_bhl=7751&ville=Chartres&fonds=BM&cote=144%20%28506%205%2FB%29. At: http://bhlms.fltr.ucl.ac.be/Nquerysaintsectiondate.cfm?code_bhl=5718&requesttimeout=500. The text is not edited, but it is transcribed from the Milanese manuscript in the ‘Catalogus codicum hagiographicum Latinorum Bibliothecae Ambrosianae Mediolanensis’ (1892), p. 274. In Gioanni and Grévin (2008), p. 41, Sermo de sancto Matthia of Bertharius of Monte Cassino (BHL 5695-5696) is given as BHL 5718, but this is likely an error. Edited in PL 129, cc. 1024-34. More on the Recognitiones in Irmscher and Strecker (2003), pp. 483-540. On the excerpts in the Virtutes Apostolorum, see Steinová (2011), pp. 49-50. Cf. Rehm (1965), pp. 42-43. Based on the lecture delivered at the Summer School on Christian Apocryphal Literature, Strasbourg (June 2012), to be published in the proceedings of the Summer School. Bischoff’s Katalog lists, for example, two ninth-century fragments containing the acts of Simon and Jude, that are unknown to BHLms. 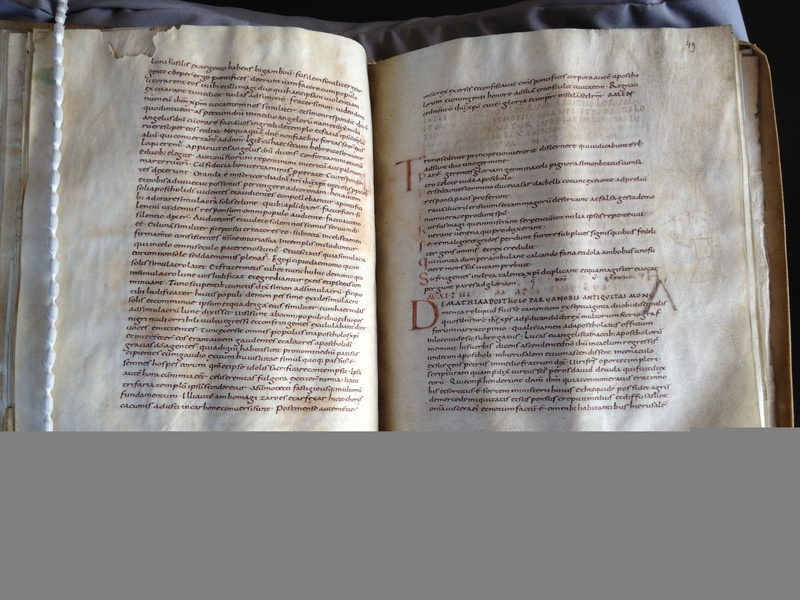 These are: two folia from the second half of the ninth century preserved in Basel, UB ms. N I 2 no. 22; and Merseburg, Domstiftsbibliothek 201/I from the first half of the ninth century. Bischoff (1998), no. 296; and Bischoff (2004), no. 2763. Ms. Montpellier, BU 55 (8th/9th c.) contains the whole Virtutes in 36 folia, i.e. 4.5 octava, and Graz, UB 412 (9th c., ¾; Aquileia) in 67 folia, i.e. 8.5 octava, comparable to the presumable original shape of the Tours manuscript. Here may be given the example of ms. Würzburg, UB Mp.Th.f. 78 from the eighth century that contains in 35 folia apocryphal acts of John, James the Great, Thomas, Bartholomew, Matthew, Simon and Jude, and Philip; at: http://bhlms.fltr.ucl.ac.be/Nqueryfolio.cfm?numsection=1802&code_bhl=7750&ville=W%C3%BCrzburg&fonds=UB&cote=MP.TH.F.078. Theological texts are attested as featuring in the codices of the Virtutes Apostolorum, e.g. in ms. St. Gallen, SB 561 (9th century, 2/2; NE France), where Cassiodorus’ Historia Tripartita follows the Virtutes; and in ms. Paris, BN lat. 11750 (11th century), where Paschasius Radbertus’ De sacramanto is contained. CITATION: Evina Steinova, Carolingian Critters II: Leiden, Voss. Lat. F 113, in: Mittelalter. Interdisziplinäre Forschung und Rezeptionsgeschichte, 22 February 2017, https://mittelalter.hypotheses.org/556. Vorheriger Beitrag Mitlesen – Mitbloggen!